This blog post draws extensively on concepts from other authors and I will reference major themes with a brief citation throughout the text. A list of reference texts is far below. Like me, you may have come across disparaging debates pitting DevOps against ITIL. There can be a tension between DevOps practitioners and the longer established practices of ITIL of which there may be up to 26 domain process areas. Traditions of understanding (Ison, 2010) differ with DevOps practitioners having an agile heritage emphasising collaboration, automation and lean practice while ITIL practitioners focus on joined up process areas interacting across a service lifecycle. When theses debates ensue I often think to myself that people can talk past each other. An opinion based on a single individuals trajectory of experience (Blackmore, 2010) is useful but it is narrow. It is very much like a story – fascinating and entertaining – but is it truth? This lack of objectivity is common to all of us – and especially the most highly opinionated – because when we talk about our problem situations as the observer we are in fact part and parcel of them : Second-order Cybernetics. Although we can create such an illusion, we do not and can not see situations in a wholly objective way. Our view of them is always influenced by our person. However if we examine a multiplicity of perspectives with an open mind while being critical of our own individual worldview we can broaden our lens, making it a wide angle and we can learn. We can learn and we can innovate. I think it would be a great idea for passionate practitioners of DevOps and ITIL to create social learning systems (Blackmore, 2010) where they literally evolve and advance the discipline of ITSM through collective learning by examining the multiplicity of their perspectives and experiences in a systemic way. In this blog post I am going to theorise about an enterprise that has incubated a network of ‘Communities of Practice’ in order to create social learning systems and then I will demonstrate how the learning systems might be used by multi disciplinary practitioner teams in a circuit of praxis to tackle complex ITSM situations. This is an idea that I have yet to put into practice – it is a theory. I would welcome feedback, especially critical feedback on the idea from anyone who may be interested. A global corporate enterprise institution has agreed to encourage, be supportive of and promote the development of a network of CoP in order to see if social learning systems will naturally emerge that it can then draw on systemically as a tacit knowledge system when thinking about complex ITSM situations. The enterprise expects that if this is successful the social learning systems will be a strategic asset. After some time it is apparent that two social learning systems, a ‘DevOps Learning System’ and a ‘ITIL Learning System’ have emerged from the formation of numerous interconnected CoP subsystems. Out of these two learning systems, the emergence of a meta social learning system is acknowledged, the ‘IT (or Digital) Service Provider Learning System’. For the CoPs to have been included in the learning systems they must have had domains, communities and bodies of practice (Blackmore, 2010) – otherwise they will be practitioner dormant and pruned from the model. The ITIL learning system has five embedded CoPs, each representing one of the ITIL V3 lifecycle phases of Strategy, Design, Transition and Operation along with CSI. Four of these have a further composite of CoPs embedded. These smaller numbered CoPs on the diagram relate to specific process practitioner domains within a lifecycle phase. For example within Strategy, ‘Portfolio Management’, within Design, ‘Availability Management’, within Transition, ‘Change Management’ and so on (BMC, 2016). It is expected that certain process practitioner CoPs will be very active, others less so. Whether specific ITIL process CoPs have active process practitioners or not may be a strong indicator of whether a particular ITIL process (there are 26) provides value in practice. In this way the ‘ITIL Learning System’ may be pruned if certain areas are dormant. However, it is worth bearing in mind that less popular process areas may have significant undiscovered value that may go wasted – a criticism of the pruning aspect of the model – so it may be useful to have ITSM thought leaders examining the processes for potential value and then attempting to create a CoP to encapsulate the value in practice. 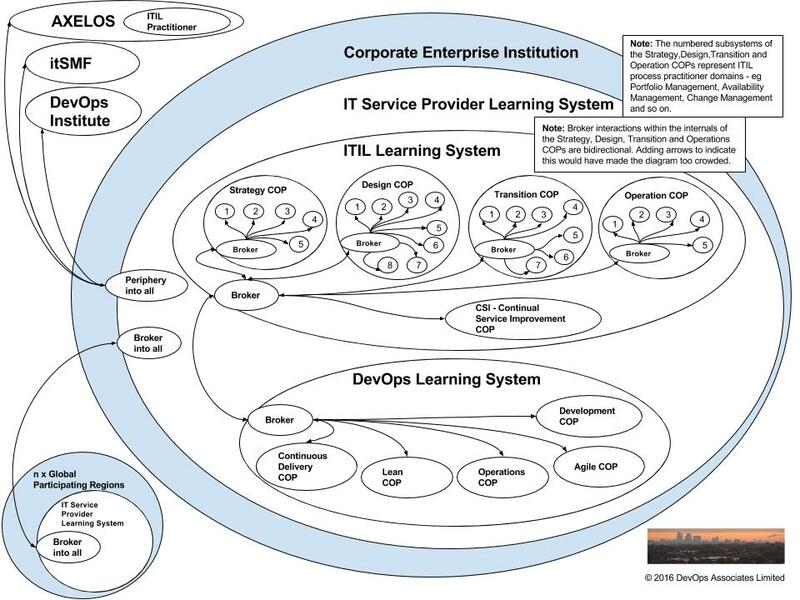 The ‘IT (or Digital) Service Provider Learning System’, a composite of the connected and brokered ‘DevOps’ and ‘ITIL’ learning systems is embedded within the ‘Corporate Enterprise Institution’ which is the environment it interacts with. The environment – ‘Corporate Enterprise Institution’ – contains the complex problems that the meta learning system is attempting to be able to adequately deal with by advancing the discipline of ITSM. The corporate enterprise has agreed to encourage and promote learning systems with similar sub structures of CoP in its multiple geographical locations across the world. This fractal design (Blackmore, 2010) allows for a community of communities globally across the enterprise. Interactions between communities in this ‘world design’ (Blackmore, 2010) allow for flat non hierarchical cross level linkage interactions where the local CoP of one location can interact directly with the local CoP of another location to promote direct learning between similar groups in different geographies. Peripheral (Blackmore, 2010) are other institutions including AXELOS who can get a view into the learning system to evaluate the praxis efficacy of for example their new ‘ITIL Practitioner’ qualification. Also peripheral are the itSMF and the DevOps Institute. The peripheral trajectory of these external systems does not at all mean that these institutions are marginalised in my model. Rather it implies in terms of CoP theory that interaction does not lead to practitioner level participation within that corporate enterprise institution but rather gives peripheral access to explore the learnings within the interconnected community in the enterprise institution. So what I mean by this is that the external institutions (AXELOS, itSMF, DevOps Institute) do not have a direct practitioner stake in the activities of the specific corporate enterprise institution in my model that has incubated the social learning systems but they may be very interested in the meta learning that is emerging from that interconnected CoP network within that enterprise because that knowledge is advancing the discipline of ITSM of which they are major stakeholders. An extensive landscape of practice (Blackmore, 2010) is now apparent in the Enterprise with many possible trajectories for the individuals working within it. Each individual may establish an identity based on a nexus of multi-membership (Blackmore, 2010) where an individual has decided to join multiple CoP’s that they have an interest in. So a person interested in capacity management and availability management in the ITIL learning system as well as blue-green deployments and canary releasing in the DevOps learning system would have established a very different type of identity to a person interested in for example change management and configuration management in the ITIL learning system and designing continuous delivery to promote standard (pre-approved) change in the DevOps learning system.This is good and healthy because it is allowing individuals to create their own sense of meaning and giving them agency (Blackmore, 2010) in their work identities while promoting organisational learning in the composite. Certain individuals in the learning systems are acting as CoP brokers (Blackmore, 2010) – they interconnect the boundaries of the communities of practice by going over and having a chat with the others, showing each CoP what the other is doing, facilitating and joining up the knowledge areas. They are a vital part of the design and the broker aspect is purposefully designed in order integrate the ITIL and DevOps learning systems to tackle the primary situation of concern – advancing the discipline of ITSM by seeking innovation via the whole social learning system. So we now have a learning system in place – great. But now what? The first thing to realise is that the learning system is largely tacit and exists independently of any problem situation that the enterprise needs to deal with in the now. The learning system must be accessed as a form of knowledge retrieval to create innovative intervention to improve very specific problem situations in the present. It is expected that individuals working in this type of progressive learning organisation will comprise cross disciplinary teams working together on specific problem situations. The individuals in a particular team will have their own identities based on their CoP memberships as described above. A specific problem situation might need to be tackled by a group of people with certain types of identities – both complementary and clashing in order to create the tension required for innovation – so the composition of a particular team may need to change from time to time. In my model a cross disciplinary team will use a collective praxis based approach to improve complex ITSM situations in the Service Provider. This approach will draw directly on the tacit knowledge within the learning system – particularly the parts of the learning system that are accessible by the different CoP identities that comprise the team. A team composition architect (a person who will design the composition of the participating team members) may make sure that the web of interaction extends into the desired parts of the learning system network by selecting an appropriate team composition that touches into those areas. What would this team do and how would they do it? 1. The team is confronted with a complex ITSM problem situation (S1) and in an intentional way they will clarify what it is they want to try and achieve via their intervention. 2. Alongside a team composition architect they check that their team composition is appropriate for improving the situation. That is to say, they critically examine who they are as a team – looking at their personal identities within the nexus of the learning system, their trajectories, their ways of knowing things and their emotional states (Ison, 2010). 3. They check to see that they have enough tension of difference within the team composition to encourage innovation and to prevent group think. 5. The team members acknowledge each other as legitimate others (Ramage and Shipp, 2009). This comes from a systems thinker called Humberto Maturana and in my interpretation means that each team member will acknowledge that they will respect the other team members and continue to develop their relationships even when they are critical of and disagree with each others opinions. 6. The team will then design a methodology for a single iteration of practice – where they will attempt to improve the ITSM problem situation. The methodology will be constructed by selecting approaches using systemic (System Dynamics, Viable Systems Model, SODA, SSM, CSH) and systematic (or borderline systematic) frameworks (ITIL V3, DevOps, Lean, Theory of Constraints, Agile, Kepener Tregoe, SixSigma and others) along with, and this is important – the tacit knowledge retrieved from the relationships that the individual team members have with their respective network of CoP’s in the social learning system. 7. The team then uses the methodology to apply changes to improve the problem situation, changing it from situation (S1) to situation (S2). 8. The team then steps back and looks at the praxis system – the enclosed box in the diagram above – and they evaluate their performance in the last iteration of practice, reflecting on what they did when they did the things that they did (Ison, 2010). Change a team member to get access to different tacit knowledge from another part of the social learning system network. 10. The team then restart their practice at step 5 in this list and this becomes an iterative process until a desired level of innovative change in the situation is applied. That becomes a judgement call and not a final destination. The community of practice has a fractal world design (Blackmore, 2010) creating a community of communities across the enterprises global regions, extending the system from the local to the international. This is a great strength because it scales the social learning system to the whole. A number of broker individuals (Blackmore, 2010) within the social learning system take an active role connecting the DevOps and ITIL learning systems and their subsystems. Via the brokers, the CoPs have sustainable interactions between DevOps and ITIL practitioners to advance the discipline of ITSM – which is the meta situation of concern. There is potential for practitioners to develop an identity and strong relationships in the network and across the landscape of practice (Blackmore, 2010). A satisfying sense of meaning (Blackmore, 2010) can be created for the individual as they reconcile their identity in the nexus of their multi CoP memberships (Blackmore, 2010). 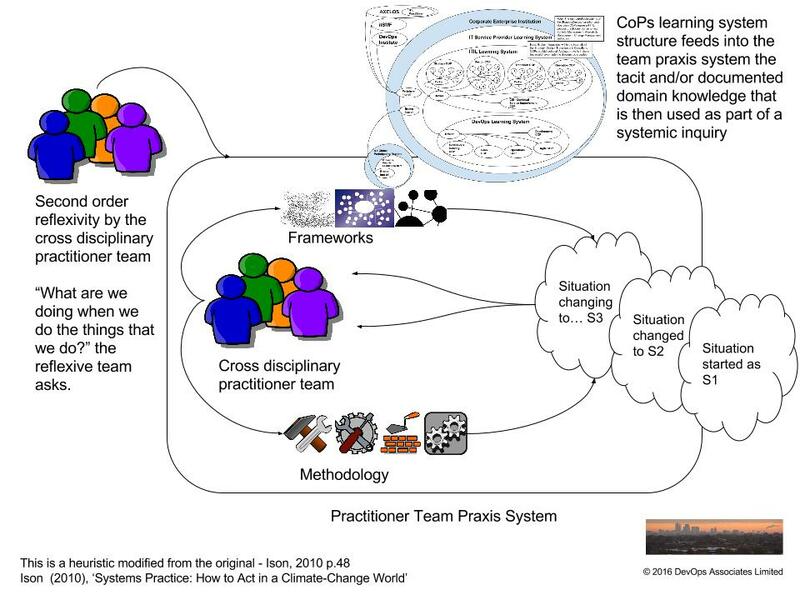 Cross disciplinary teams approaching specific problem situations gain a deeper understanding of the overall learning process by means of becoming familiar with the activities in the ‘Practitioner Team Praxis System’ – as indicated in the diagram – and iterating on it. I am thinking of this heuristic as the engine for the collective social learning of the team’s experiences. The knowledge coming out of a learning cycle in the Praxis System circuit can be reflected on by the team and then ‘synthesized and disseminated through the home communities of practice of team members’ (Blackmore, 2010) by capturing the tacit learning into the network of CoPs by documenting it in CoP knowledge bases using Wikis, Blogs, Videos and so on. This then becomes an ongoing loop of participation and reification (Blackmore, 2010). The team is being reflexive (Ison, 2010). They are looking at “What they did when they did the things that they did” and using their autonomy to redesign their next iteration of practice, learning and adapting as they change the problem situation. S1 becomes S2 becomes S3 and so on. Certain CoPs may be resistant to change (Mittendorf, 2006) – especially if they are well established. The use of systemic approaches such as SSM and CSH within the Practitioner Team Praxis System may help participants move past this asSSM is a powerful framework to reach accommodations between parties with very different worldviews where change must be feasible – not only desirable! CSH provides a way to examine the boundary judgements that people are making when they hold their strongly opinionated views. The enterprise institution as the external environment may from time to time exercise vertical power, by for example bypassing the autonomous Practitioner Team Praxis System in pursuit of reactionary systematic ends and in doing so they interfere with the efficacy of social learning system. Being an open system structurally coupled to its environment, the learning system may be shocked and restructure in a form which may or may not be an improvement to its objective of learning (Ramage & Shipp, 2009). The reason for this interference by the enterprise may be a lack of understanding or appreciation of the Practitioner Team Praxis System and the enabling Social Learning Systems. If the enterprise is reminded of the primary purpose of these systems – they are a strategic asset to advance the discipline of ITSM – then this may minimise these vertical power interruptions. In particular, the model lacks a Learning Governance component. Which complex ITSM problem situations are important to learn about and which are less so? My social learning system model implies emergent governance but stewarding governance (Blackmore, 2010) may be more suitable if there are causes to be championed and big deal problems that the learning system wants to prioritise. What is missing from the model? Integrating DevOps and ITIL practice will often involve a clash of worldviews. It is expected that this will be handled with the SSM Systems Thinking approach in the frameworks part of the Practitioner Team Praxis System. However – missing are Systems Thinking facilitators and it would be good to have a few skilled facilitators of SSM in the practitioner teams. The facilitators must have high competencies in the SSM framework and conflict management. Ethics are not directly addressed in the design but could be considered by ‘establishing shared values and regularly re-evaluating the purpose of the CoP’ (Blackmore, 2010). Also a collective evaluation by the governance (stewarding or emergent) of how the CoP’s are relating to each other during their cross linkage boundary encounters is practical and would be useful in my view.